If you ever want to see me turn into a little kid, drive right past all the Orlando theme parks and take me to Cape Canaveral, home of the Kennedy Space Center. This is where the Supermen of my youth lived, climbing on top of giant rockets and heading off into space. Both Diana and I had been here several times in the past, both as children and also as a couple. While it was always exciting to see, the business of space travel was never presented very well back then. That has all changed, now that NASA has allowed a private company to run the visitor center. It’s like a theme park, only the rockets on display are the real deal! The first thing visitors see coming into the center is the rocket garden. 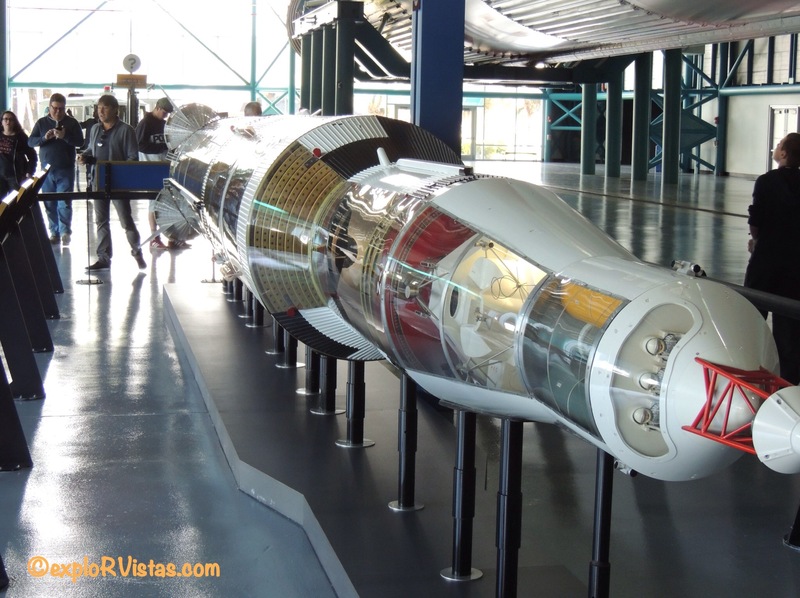 Several rockets are displayed that were the early hardware used to get the Mercury and Gemini astronauts into space. 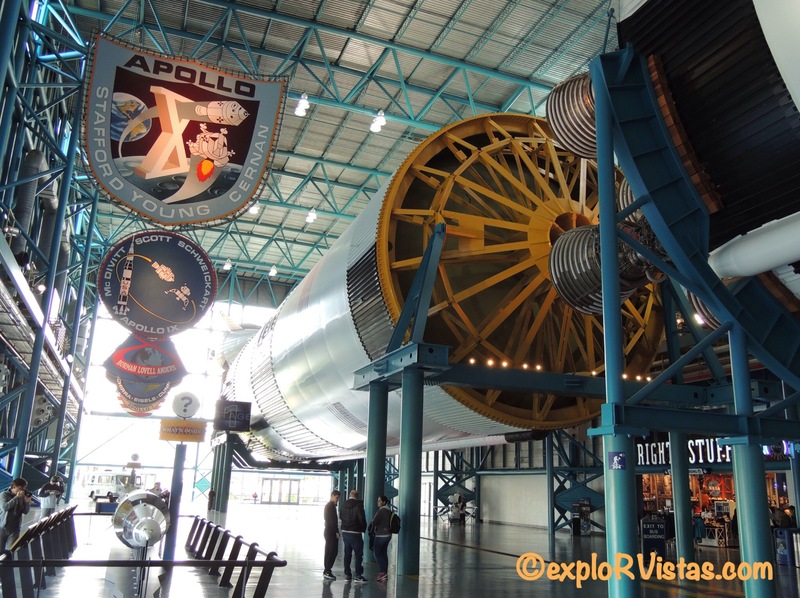 Across the back is a Saturn 1B that was similar to the one that took Apollo 7 into Earth orbit. It is the smaller cousin to the Saturn V rockets that went to the moon. 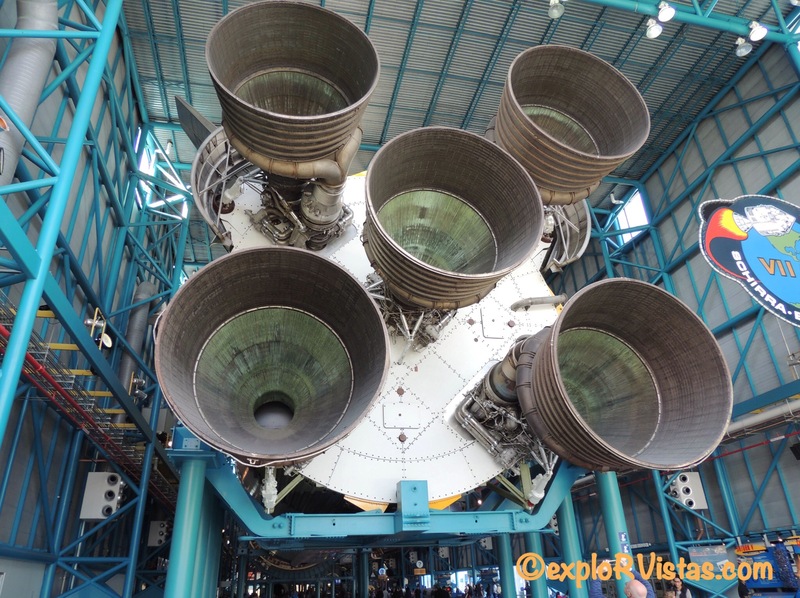 They had a Saturn V first stage F1 engine on display. Remember this engine; I’ll talk more about it later. A highlight in the rocket garden for me was this gantry. This is the actual catwalk that the Apollo 11 astronauts walked across on their way to their space capsule. Those were their last steps on earth before they stepped out onto the moon. At that time, it was 300 feet above the ground as part of the launch pad. 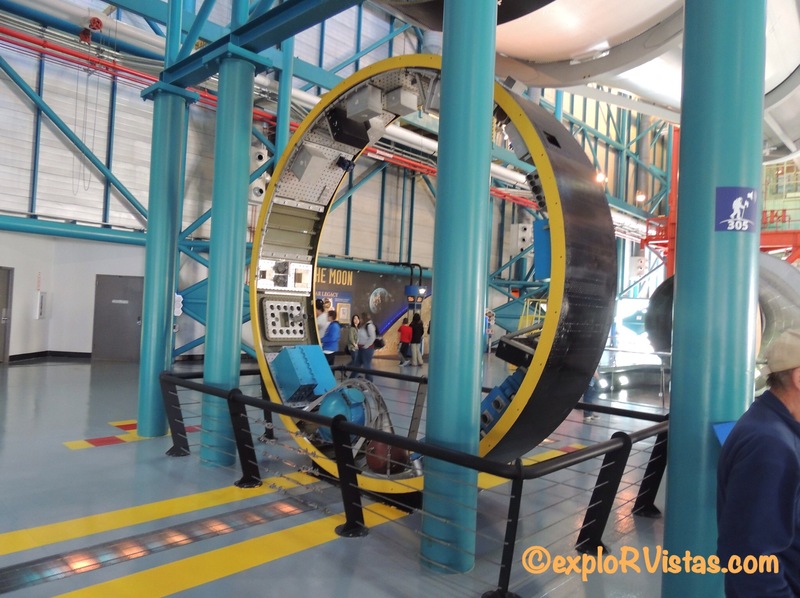 From there, we headed over to the Astronaut Encounter. The astronaut there that day was Jon McBride, who actually piloted the Space Shuttle Challenger on an earlier mission before it exploded in January of 1986. He gave a very interesting presentation, and we got to shake his hand and pose for a picture afterwards. As you can well imagine, I was pretty excited at this point! The rocket in the background is a model of the Orion, the vehicle that will take astronauts to Mars. 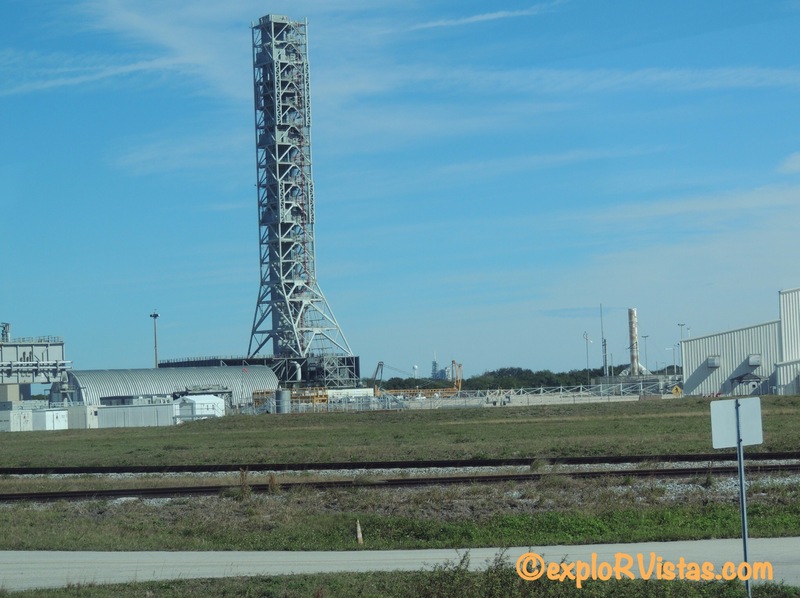 From there, we boarded a bus and headed out towards the launch pads. One of the first things we saw was the Vehicle Assembly Building. This is where the Saturn rockets and the shuttles were assembled and readied for launch. This is the largest single story building in the world. It actually is big enough that it creates its own weather inside, forming rain clouds near the ceiling on humid days. Those are giant doors on the side that allow the rockets to be moved out. I remember my dad marveling at the fact that it takes 45 minutes to open them. 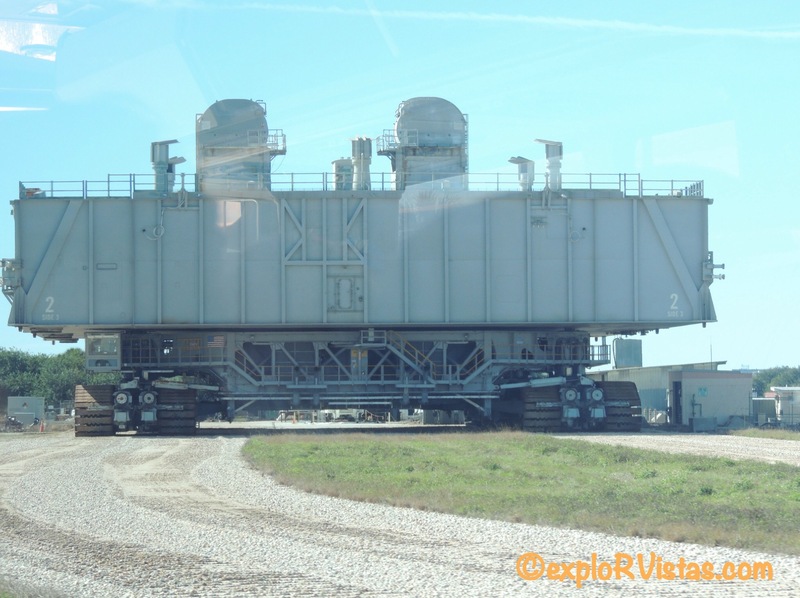 This is a shuttle platform, sitting on top of a crawler transporter. NASA has two of these transporters, both being built in 1965. Each one weighs 6 million pounds and gets 127 gallons per mile of diesel fuel. It definitely will pull our fifth wheel. Let’s just say that, with that kind of fuel consumption, we won’t be using one of these for our next tow vehicle! 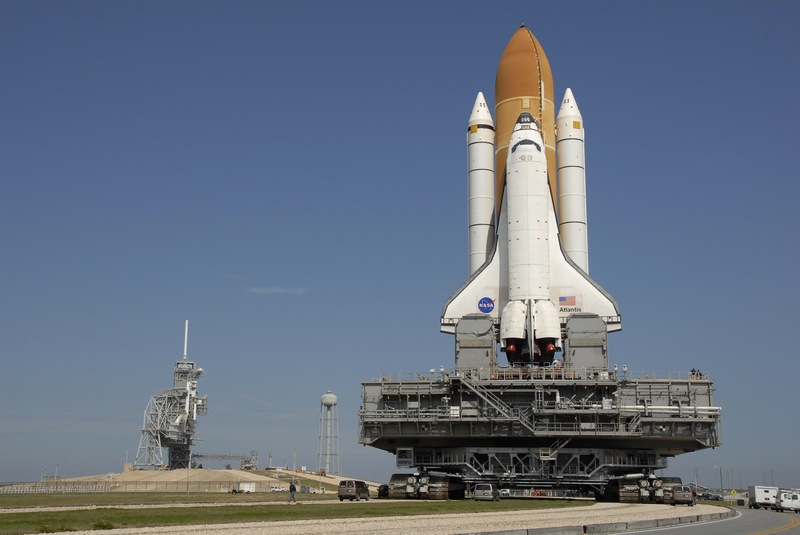 This is an older NASA photo of the Space Shuttle Atlantis riding to the launch pad on the back of a crawler. When they get to the slanted pad, the one side of the transporter raises up to compensate for the angle. The reason the pad is raised is because the ground is basically at sea level here. Each pad has a flame pit for the exhaust from the rocket to be channeled away as the vehicle lifts off. At the point of ignition, the entire contents of the water tower in the background is sprayed into the pit to deaden the noise…which is otherwise strong enough to stop a human heart at close range. They also drove us past this tower that was being constructed on a mobile launching platform that was being converted from the shuttle days. This will be used for Orion. One of the other launch pads was being used by SpaceX, a private company that launches satellites and supply ships to the space station. Once we were done riding around the launch pads, the driver dropped us off at the Saturn V Center. This building holds an actual Saturn V rocket displayed in a horizontal position. This is Apollo 18. It never flew, as Congress ended the Apollo program three flights early. 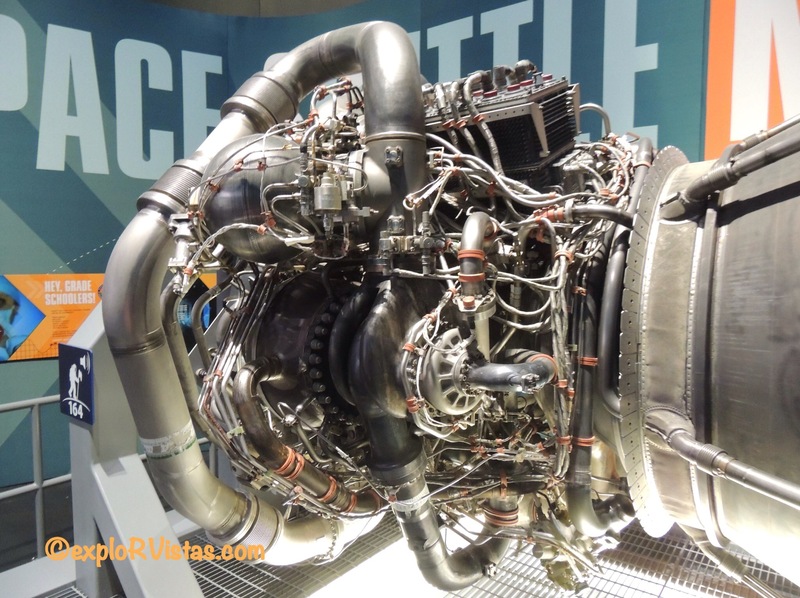 Remember that F-1 engine I showed you earlier? Here are five of them, mounted into position and ready to go. When one of these rockets lifted off, these engines would lift the vehicle to an altitude of 42 miles in 2-1/2 minutes, accelerating it to a speed of over 6000 miles per hour. Divide those numbers and that’s an acceleration of 40 miles per second! This is the other end of that first stage of the rocket. Once it did its job, it would fall into the Atlantic Ocean. Then the second stage would take over with its five smaller engines, followed by the third stage with its single engine. This cutaway model showed how the entire rocket fit together and worked as a single unit. This was supposed to have been the Lunar Module from Apollo 15. NASA decided to send along a lunar rover (car) on that mission after this was already built. This unit didn’t have room on it to store the rover, so it became a museum piece. It is interesting to note that the ladder on the lander is not strong enough to support an adult human on Earth. On the Moon, a human weighs 1/6th of what they weigh on Earth, so it works just fine there. This three foot wide ring was interesting. It was positioned on top of the third stage and it contained the instruments and computers that guided the rocket from launch to a point that the spacecraft seperated from the third stage, beyond Earth orbit. The fact we found interesting was that today’s cell phones are more powerful than the computers contained in that ring. The Saturn V Center also contained a number of artifacts from the Apollo program. Space suits, hardware and other items are well represented. 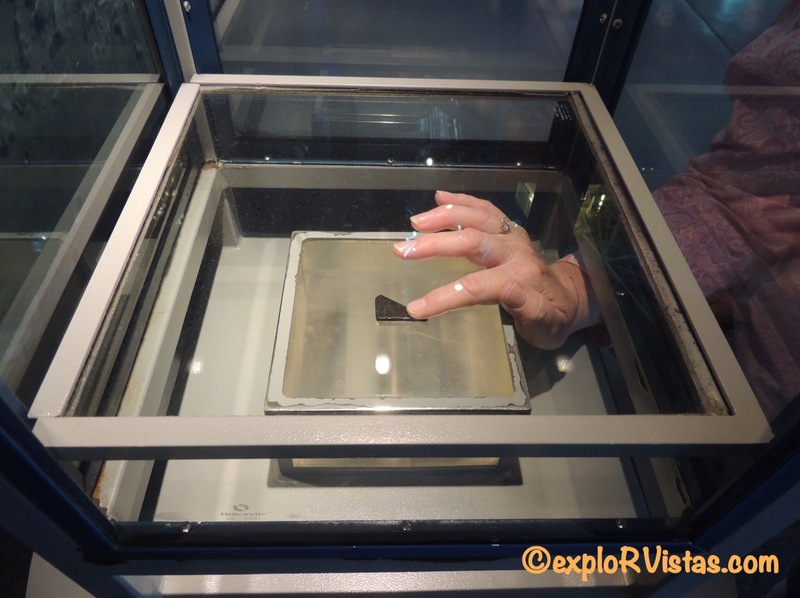 Here, Diana is able to touch a piece of moon rock. 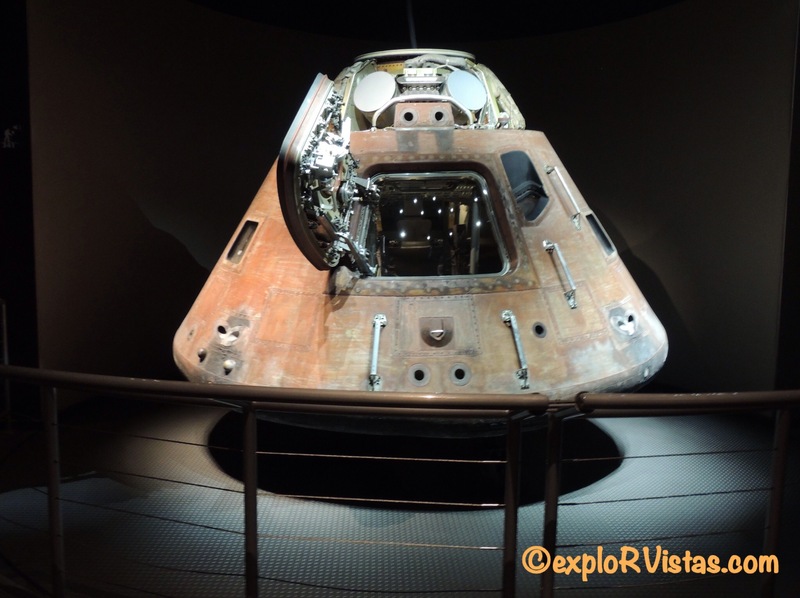 Here is the Command Module from Apollo 14. This was the capsule that Alan Shepard and his crew rode in to and from the Moon. It is interesting to note that, of 363 feet of Saturn V rocket at launch, this 11 foot tall spacecraft was all that returned at splashdown. 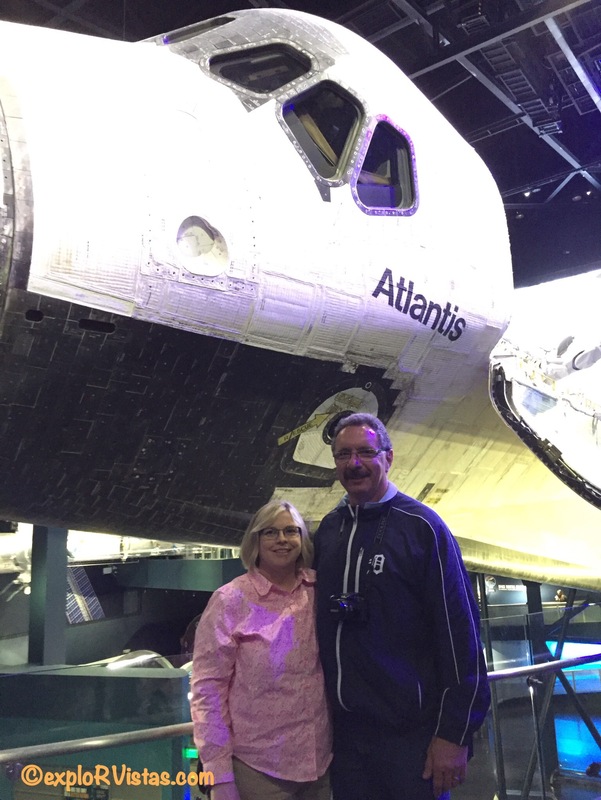 Once we finished our tour of the Saturn V Center, we toured the Space Shuttle Atlantis building back at the main visitor center complex. 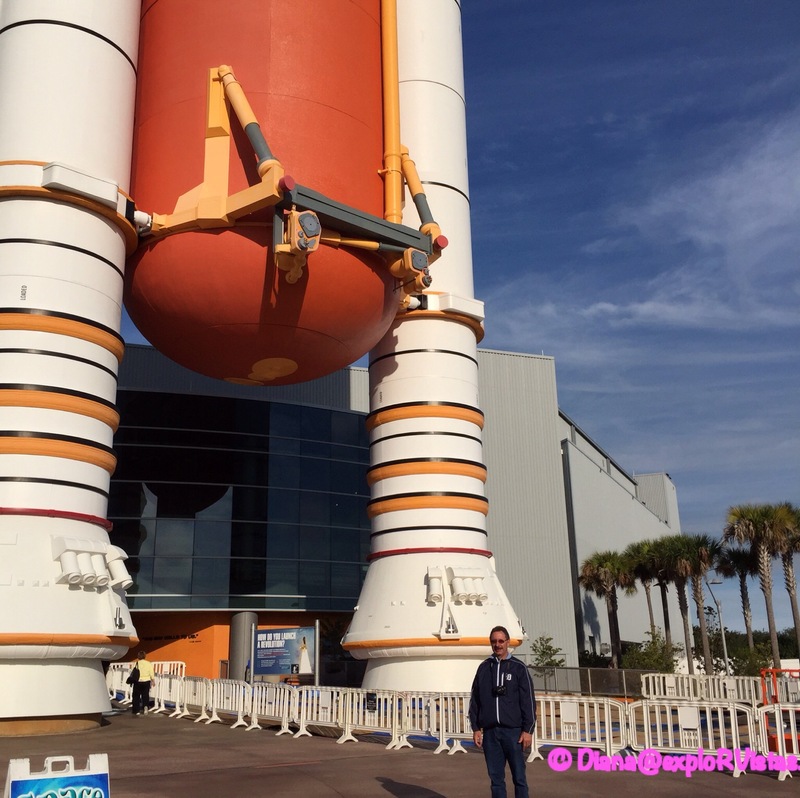 Here I am beneath a mockup of a main fuel tank and two solid rocket boosters used to launch a shuttle. Once inside the facility, you get to see Atlantis, the last shuttle to fly into space. The ship is displayed as it would appear in Earth orbit with its payload bay doors open and its robotic arm extended. All of the cracked tiles and smudges from repeated missions into space were left to show visitors what this ship went through. This really is the ultimate RV. 🙂 We were impressed by the sheer size of it! The building was arranged so you could view it from multiple points on different levels. We saw the shuttle Columbia twice. We saw it land piggyback on a 747 at Kelly Air Force Base Nov. 21, 1982. We also saw Columbia launch in Florida on April 4, 1997. These were both fantastic experiences, but it didn’t allow for the close up view that we enjoyed at this display. Here is the underside of the orbiter. 33 missions over 26 years and 125 million miles, and it still looks great. If it were a car on its last mission, it would have qualified for antique vehicle license plates! 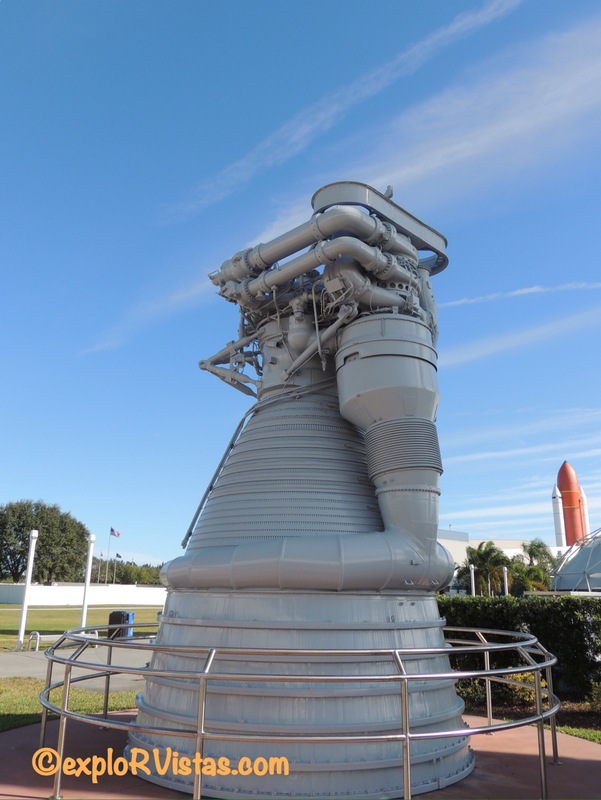 This is the upper portion of a shuttle main engine. While Diana and I were looking at this and trying to make sense of it, a docent came up and asked us if she could answer any questions. It turns out she had worked on the computer systems for these engines for twenty years. Her intelligence was astounding, yet she explained the “spaghetti” we were looking at in a way that made reasonable sense. The cell phone reference came up again when she mentioned that our iPhones had more capability than the engine’s computer. I mentioned to her that smart phones are a result of the efforts of the space program, to which she agreed. 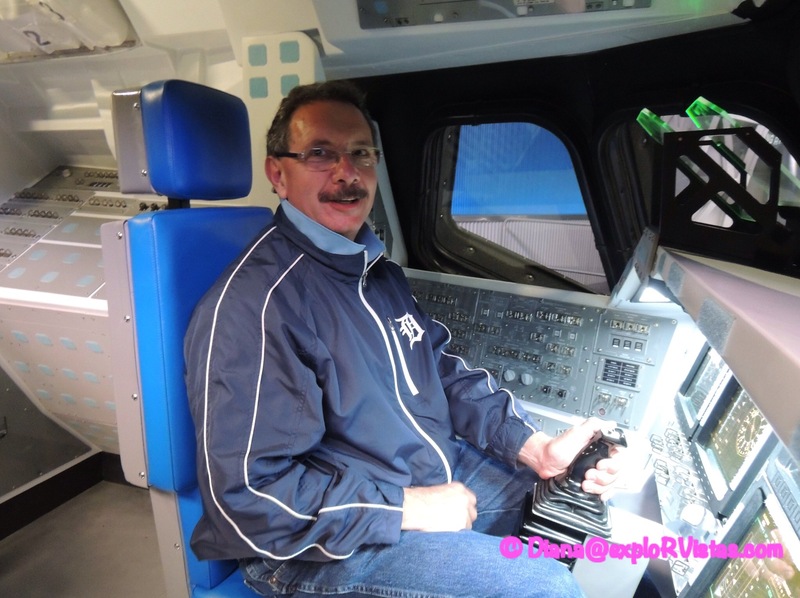 There also is a simulator that allows you to experience what it feels like to be launched in a shuttle. We opted to save that for another time. Near the nose of Atlantis was a display that honored the 14 men and women who lost their lives in the Challenger and Columbia accidents. Each display had personal artifacts from each astronaut. 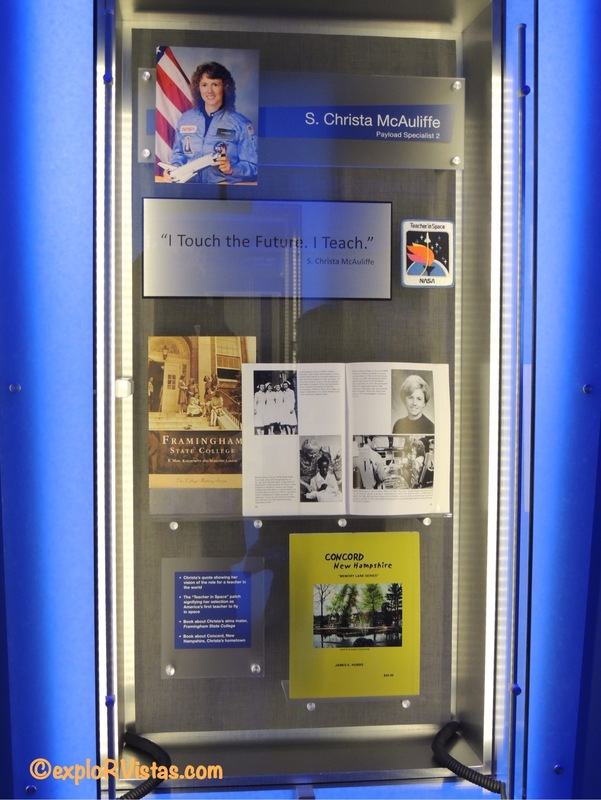 Here is Christa McAuliffe’s display. January 28, 1986 was a hard day for me, as Diana was an educator. Watching interviews with Christa prior to the mission, I personally saw the same determined and positive traits in her that I see in my wife. Diana will tell you that I looked at the TV during one of those interviews and said “If you let anything happen to her, NASA… I will never forgive you.” To be honest, it took me a long time to forgive them. I eventually did, as I knew that Christa McAuliffe and the other sixteen American astronauts who gave their lives in the pursuit of space exploration would have wanted the space program to continue. 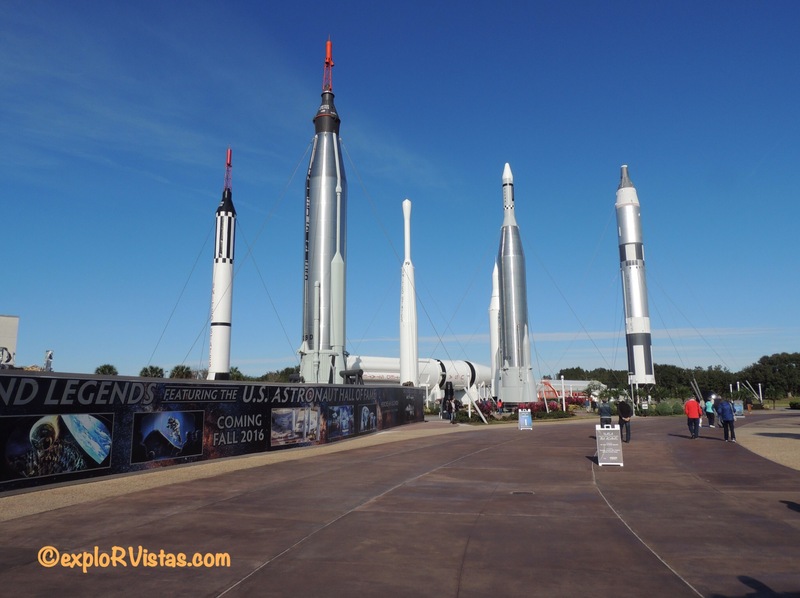 If you are in central Florida and have the time, be sure to visit the Kennedy Space Center. Plan on getting there early, as it will consume your entire day. Take your time and appreciate mankind’s greatest adventure. These people explored the ultimate vistas in some of the greatest RV’s ever built! Nice post. Really appreciate all the detail that you included. Thanks, Tracy! We were excited to see that they were doing things post shuttle. Love the post. I’ll have to ask the kids if they’d like to see the Space Center when they come. For some reason they want to go to Ormand Beach. It’s hard to imagine the amount of power it takes to send one of those buggers into orbit! Holy cow! That is great stuff, Peter! I will say, I am envious. One thing Jon McBride spoke about was meeting John Kennedy as a candidate for president. Once Kennedy gave his speech, he was inspired to become an astronaut. Such a great place. Fred and I enjoyed our visit a couple of years ago. 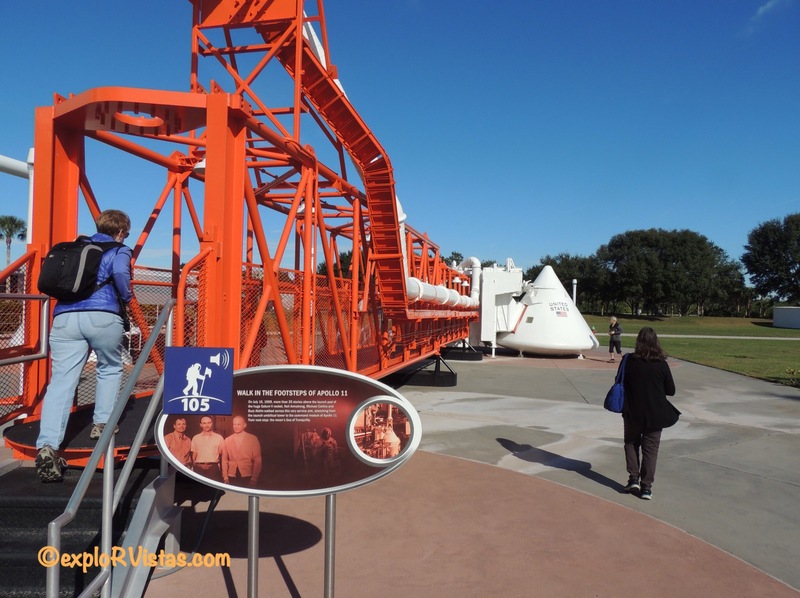 It brought back so many wonderful memories of the space race and gave us hope for future exploration. 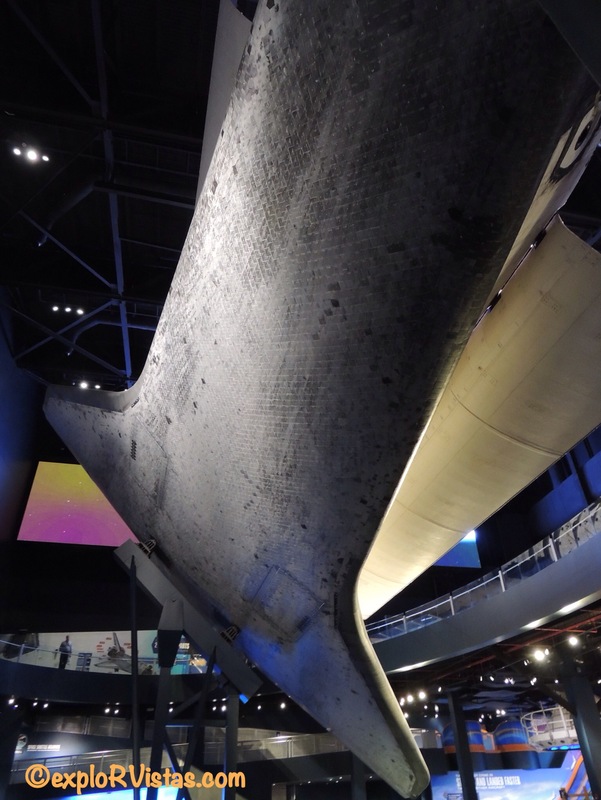 We recently had a chance to visit the Johnson Space Center here in Houston. I was so impressed with the the progress being made on Orien and have hopes to see that mission accomplished in my lifetime. That is great, Bonnie! We would love to visit there and also Huntsville. 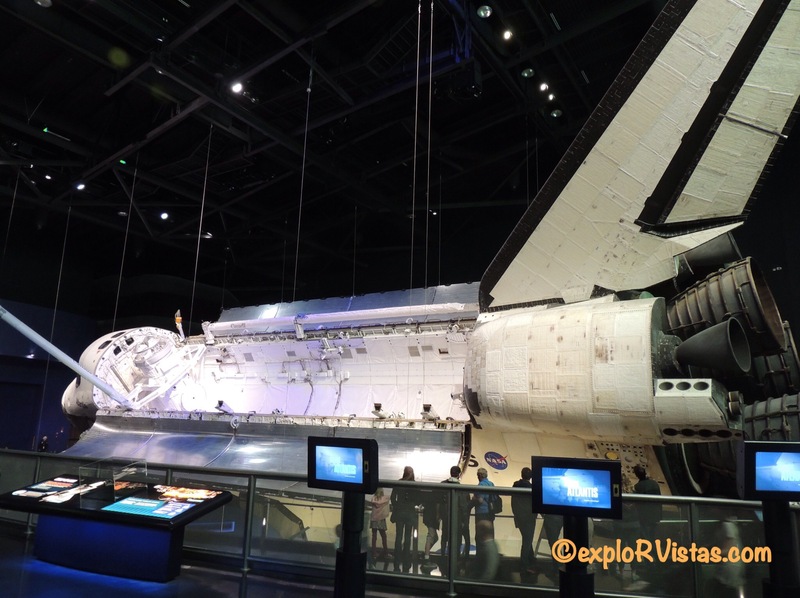 We did enjoy our exploration at the Kennedy Space Center. IF ever you drive to Texas the Johnson Space Center where mission control is, is also a must. Then you can tie both together. I just went back and read your posts on both KSC and JSC. So cool! 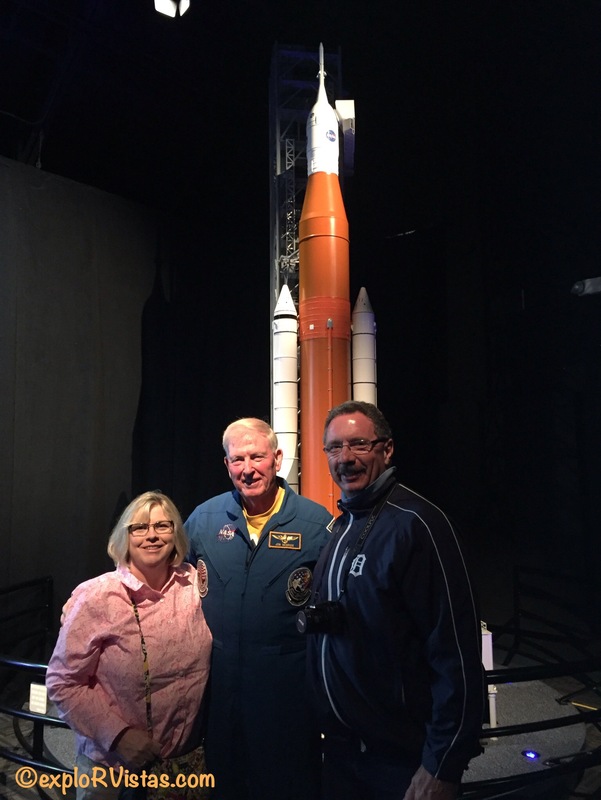 It is so interesting to see that NASA actually launched Orion in between our visits. All of the shuttle equipment has now been removed from 39-B in preparation for Orion. 39-A still has the shuttle tower on it, and SpaceX is using the pad itself to launch their rockets. Exciting! In elementary school I did a couple of reports on the space program, each time NASA mailed me a big envelope of information – I loved getting that mail! Great post, love the pics and all the background. The difference between the capsule and the shuttle just in size alone is really impressive! I loved the reusability of the shuttle, Jodee. Awesome post! You have inspired me to visit JSC while I am in Texas and will plan to see SC when we are in Florida in March. Thanks for all of the info and inspiration. Oh wow, it looks like a theme park we would enjoy immensely ! I would definitively visit it if I go to Florida one day ! 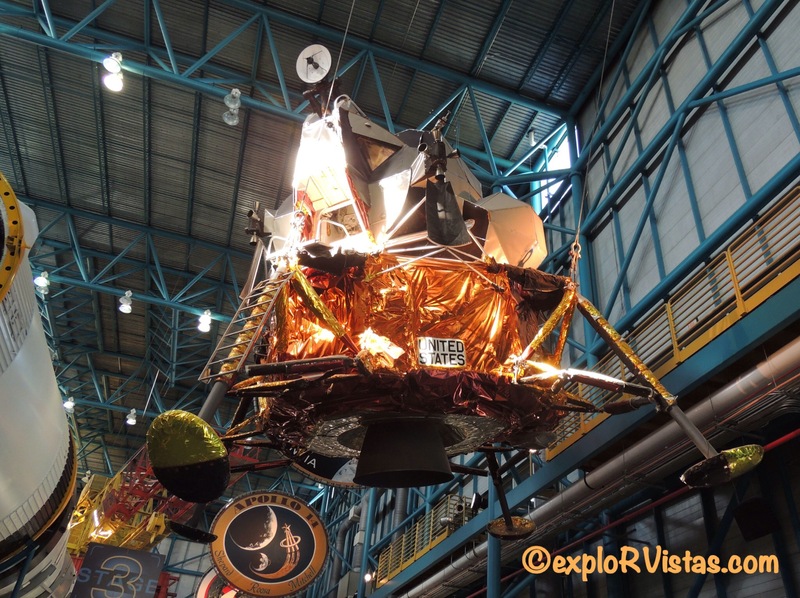 Do they have other museums that talk about the NASA or places you can visit nearby ? Other than the theme park ? In Florida, NASA is pretty much confined to Cape Canaveral, Gin. Houston, TX and Huntsville, AL both have space related items too, as does the Smithsonian in Washington DC. One thing the actual visitor center and Saturn V center do is transcend the industrial feel the Cape has. After all, it takes a lot of un-glamorous hardware to put a rocket in space. 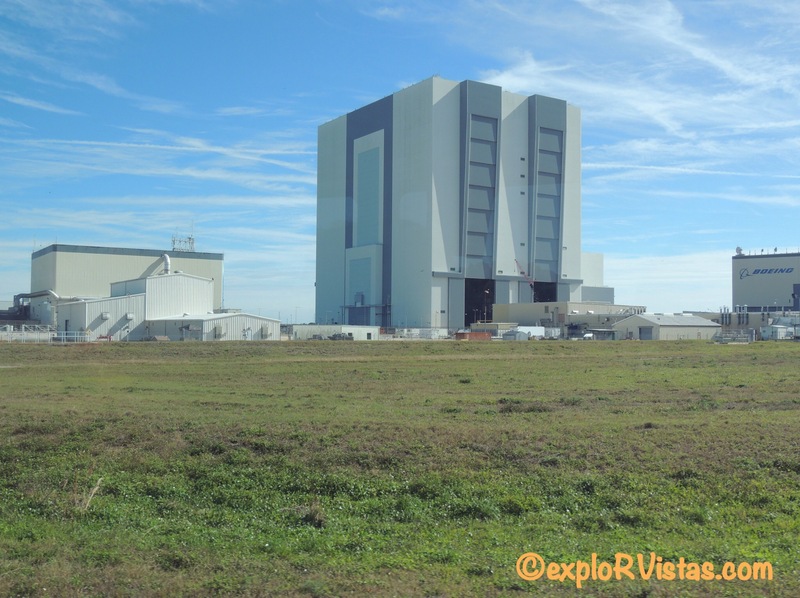 A launch pad isn’t what one might call ‘beautiful’…even though it is truly amazing to me. Oh the Smithsonian is a place I will definitively visit ! It’s so mythical. And I’ve visited a lot of natural history museums but this one is still on my list ! I really have to do a road trip on the east coast, but we need a few weeks for that ! I have a lot of national park I want to check out on the way and plenty of cultural places as well. Being a rocket engineer (ok I am just a rotating equipment engineer, but that’s pretty close!!) I find this stuff awesome;) Would love seeing it in person! Oh, this tour would definitely fascinate you, Inger. Better get a two day ticket! Looks like a great trip and you have done a fantastic job of making us want to go. It is amazing what a difference a good marketing plan can do. Sounds like a great visitors center. Add it to the list!!! Well, Maja, as an astrophysicist, I’d have to believe you would find it remarkable. The amazing part to me is to see what they did with the technology available to them at the time. Toggle switches and hand written math problems were more common than semiconductors. The space race really advanced our technology, hats for sure.